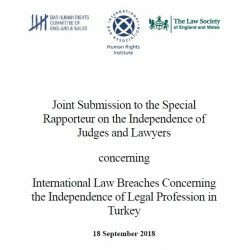 The Bar Human Rights Committee alongside the Law Society of England and Wales and the International Bar Association Human Rights Institute have sent a joint submission to the Special Rapporteur on the Independence of Judges and Lawyers concerning the independence of the legal profession in Turkey. The submission raised concern for the fair trial rights of lawyers facing prosecution in Turkey following the failed coup attempt in July 2016, including concerns for the independence of the judiciary and concerns about the independence of the legal profession, such as hindrances to the effective performance of lawyers’ professional functions, direct interference with the independence of bar associations and denying admission to the bar. The submission also highlighted its concern over the arbitrary arrest, detention and wrongful prosecution of lawyers in Turkey, as well as concern for the safety of those currently detained. Evidence collected by the organisations suggests more than 581 lawyers have been arrested, 1,542 prosecuted and 168 lawyers convicted. Guarantee the independence of the judiciary and the prosecution services, in accordance with the UN Basic Principles on the Independence of the Judiciary and the UN Guidelines on the Role of Prosecutors. Ensure that lawyers are entitled to form and join independent and self-governing professional associations as protected by Principle 24 of the UN Basic Principles on the Role of Lawyers.